In Selma’s most iconic scene, Martin Luther King Jr. is standing on the Edmund Pettus Bridge, a structure named for a former Grand Dragon of the Ku Klux Klan. Behind him are thousands of marchers—mostly black, but some whites too—demonstrating against the suppression of African-American voter registration in Alabama. In front of King is a posse of state troopers and county police, as well as a throng of hostile onlookers, holding Confederate flags and hateful signs. Millions are watching on television, fearing they are about to witness a repeat of what had happened two days earlier, when marchers attempting to cross the same bridge were savagely beaten by the Alabama authorities. But on this occasion, the troopers move to the side of the road, seemingly allowing—or, perhaps, daring—the demonstrators to pass. All eyes turn to King. He kneels in prayer, and after a moment of quiet reflection, turns around, and heads back toward Selma. This, in a nutshell, is the power of Selma. The settings are epic; the stakes are high. A cloud of violence pervades the movie—and on several occasions, it does not shy away from depicting how that violence often manifested itself in truly terrible ways in 1965 Alabama. But, still, like King surveying the scene on the Pettus Bridge and deciding to turn around, DuVernay has made her film with a remarkable degree of restraint. Her heroes are not always heroic; her villains are more than just villainous. By not indulging in these sorts of extremes—which is probably tempting for filmmakers who are working with such extraordinary historical events—DuVernay and screenwriter Paul Webb have created a nuanced, human depiction of an important chapter of the Civil Rights Movement, one that rings especially true and finds an important relevance today, fifty years after the Selma marches. 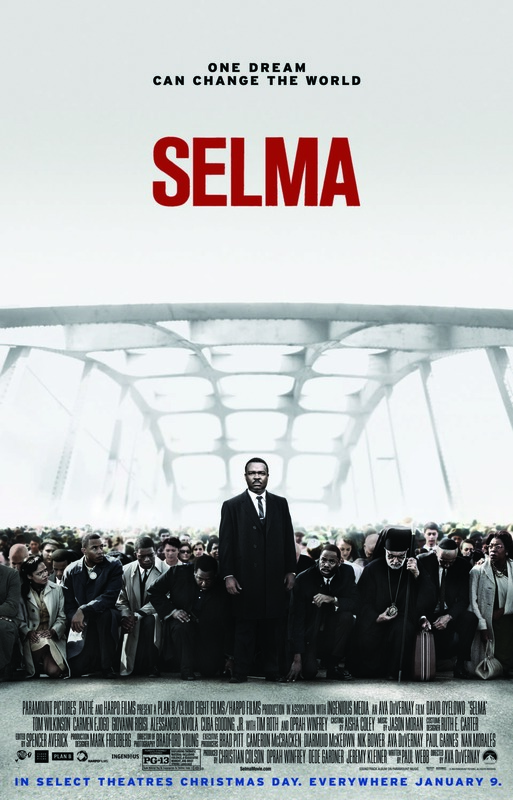 Selma is less a biopic of King (David Oyelowo) and more the story of how he and other leaders of the civil rights movement rallied the grassroots momentum to eventually convince President Lyndon B. Johnson (Tom Wilkinson) to introduce the Voting Rights Act to Congress. The bulk of the movie focuses on the organization and consequences of a series of three marches from Selma to Montgomery that civil-rights leaders planned in March of 1965. Throughout Selma, we see the toll that the movement is having on King’s personal life, specifically his relationship with his wife (Carmen Ejogo). We also get glimpses into the minds of some of the political leaders of the day, including President Johnson, who has sympathy for the movement but is reluctant to put his full weight behind it, and Governor George Wallace of Alabama (Tim Roth), a rabid segregationist. In Selma’s first two sequences we see humanity at its best, as King accepts his Nobel Peace Prize in Oslo, and then at its worst, as four African-American girls are killed in a church bombing in Birmingham, Alabama. Indeed, there are many black-and-white moments throughout the film: acts of unequivocal courage and those of astounding hatred. But so much of Selma is shades of gray. Oyelowo does not portray a version of Martin Luther King who is simply a saint, but rather a man who clearly bends under the great burden of the tasks ahead of him and, at times, wallows in the guilt of his all-too human shortcomings. And throughout the movie, King and other notable civil-rights leaders—John Lewis (Stephan James), James Bevel (Common), James Forman (Trai Byers), and Malcolm X (Nigel Thatch) as well as many other individuals who were instrumental in the movement but whose names have not been as well-preserved by history—quarrel over tactics in a way that is sometimes petty and very much wrapped up in their own egos. In short, the heroes of the movie feel authentic, like actual human beings who find themselves together in a long and trying fight. At the other end of the spectrum, Selma’s antagonists feel similarly real. Antagonism is an ingredient in movies that often requires the greatest suspension of disbelief. Most of us like to think that humans are, at their core, good, and yet every movie needs someone or something to be pushing back against the heroes’ efforts. To really convince us of the antagonists’ sincerity, storytellers have a tendency to craft them as hands-wringing, mustache-stroking caricatures. With a wealth of such despicable human behavior during this era at their disposal, DuVernay and Webb would have an easy time making those sorts of decisions here, but they generally avoid that temptation. Tim Roth, in his portrayal of Governor Wallace, is sometimes snake-like and despicable, but at other times seems small and pathetic, one man standing in a storm shouting at the wind. The antagonism is also fairly spread out among many characters—Wallace, Colonel Lingo (Stephen Root), and J. Edgar Hoover (Dylan Baker), to name only a few—so the film does less to single out individuals worthy of our scorn and more to paint a picture of a society that was profoundly and pervasively unfair. And then we have Johnson. It seems that every Oscar contender these days comes with some dash of controversy, and for Selma, LBJ fills that niche. Many have challenged the historical accuracy of Johnson’s depiction as being too reluctant in his support of King and the Civil Rights Movement. Obviously, I’m not an historian, so I can’t directly comment on these claims. But Selma is not the only recent major work to depict LBJ: Bryan Cranston played him in the Broadway production of Robert Schenkkan’s Tony-winning play All the Way, and there didn’t seem to be similar complaints made against that work. Last December, I saw the Seattle Rep’s production of All the Way, as well as its sequel The Great Society, and I found the depiction of LBJ in Selma to be entirely consistent with the one in Schenkkan’s plays. In both, we see a man who is generally supportive of King and his efforts, but who does not necessarily want to make civil rights his top political priority. Johnson is frustrated by what he perceives as King’s lack of trust and patience, and the relationship between the two men devolves. Although I’m a bit puzzled why Selma has been the target of these criticisms that Schenkkan has avoided, I welcome the attention that LBJ has received because, in many ways, he is the film’s most important character. Almost fifty years to the month after the Selma marches, it’s tough to watch the movie and not see the stark relevance the film has to the national discussions that have been taking place in this country on the deaths of Michael Brown and Eric Garner and on race more broadly, and Johnson is the most clear illustration in the film of the costs of agnosticism. During one exchange in the Oval Office, LBJ says to King, “You’ve got one big issue, I’ve got a hundred and one.” Most people who watch Selma are not Kings who devote their careers to representing marginalized communities, nor are they Wallaces who seek to obstruct progress at every turn. Most of us are LBJs: well-intentioned people who must sometimes be reminded during our busy lives with a hundred and one important issues of the one or two that cannot wait.